With the rise in technology, the need of ultrafast quantum computer has also increased that can work on huge numbers and calculations at the same time. Quantum technology has long been a scientific dream, but now it is a step closer to becoming a reality after a team of scientists has figured out a way for a standard silicon chip to tackle quantum entanglement. 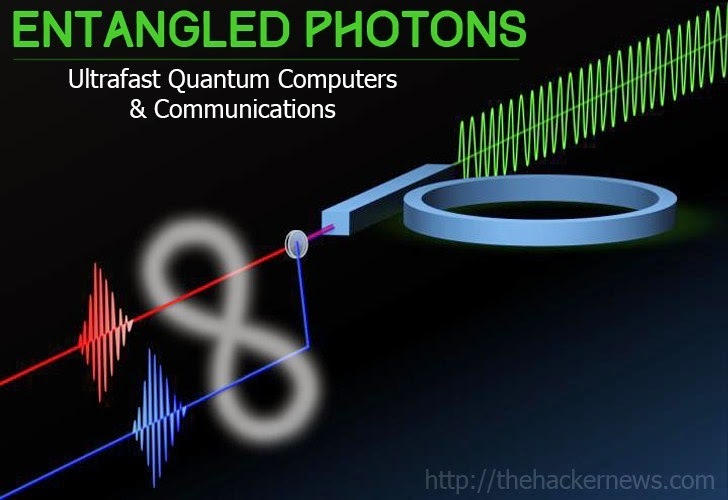 Entanglement — a phenomenon in which multiple particles are connected to each other and act in uniform no matter their distance apart — is the key ingredient that promises to make ultrafast quantum computers and secure communications (encryption) far more powerful than conventional computing devices. The new research, detailed in The Optical Society’s (OSA’s) new high-impact journal Optica, describes how a multinational collaboration of boffins, for the first time, have created a new Micro-Ring Resonator that can generate a continuous supply of entangled photons; photons are essentially the particles that make up light. The commercial quantum key distribution (QKD) devices already exist, but using quantum entanglement onto silicon chips has proven to be a difficult task because of the large size of the devices used to emit entangled photons. However, the use of a micro-ring resonator which is small enough to fit onto a standard silicon chip that produces a continuous source of entangled photons is the foundation of making such technology widespread ae well as affordable. The team of scientists from Italy, the UK and Canada was able to "demonstrate that silicon ring resonators in a silicon-on-insulator platform are an efficient source of time-energy entangled photon pairs." Thereby, it can allow for more powerful computer chips and better encryption technology. "We can confidently expect that silicon mircoring resonators will become the dominant paradigm of correlated photon sources for quantum photonics, both for applications involving the transmission of quantum correlations over long distances, such as quantum cryptography, and for applications involving quantum information processing 'on-a-chip'," the research paper notes. As we already mentioned that Entangled photons is a phenomenon where two particles, once associated, retain the flavours of that association even after separation, no matter how far they are. So, these two particles created at the same point and time share a single existence, which Einstein referred to as "Spooky Action at a Distance." If something acts on one of the entangled photons, the other one will respond to that action instantly (even if it is on the opposite side of a computer chip or even the opposite side of the Galaxy). The two photons can be considered to be, in some sense, a single entity. First, i.e. the instantaneous reaction property, can help increase the power and speed of computations, and by virtue of their behaviour as single entity, the entangled photons would allow for new communication protocols that are immune to spying. The research paper titled, "A micrometer-scale integrated silicon source of time-energy entangled photons" , is also available as an Arxiv pre-print. You can download from here.